Following on from yesterday's post about the Music House for Children, one of my readers reached out to me to draw my attention to some more music happenings very soon just down the road from the Bush, in Acton. Although Oxjam Shepherd's Bush Takeover has been well publicised on this and other blogs and local media, I accept that it may not be everyone's cup of tea and so it was nice to hear about two other different music events happening in Acton in support of Oxjam but with a very different groove, baby. 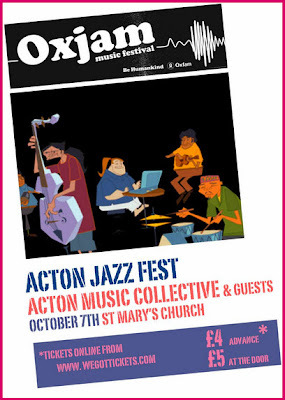 On 7th October 2011 local band Acton Music Collective (AMC) are performing at St Mary's Church and the audience can expect a mix of jazz, latin, rap and gospel music played by a group of talented musicians who came together as part of this community outreach program led by the church's own tenor-sax playing Rector, Dave Bremmer. For more information and to buy tickets have a look here. A week later on 15th October 2011, DJ Theo de Rose will be taking over the decks at George and Dragon pub in Acton to deliver music which quite frankly I shouldn't love because of my age, but I can't help but adore. He will be playing an eclectic mix of songs made popular with the now sadly defunked nightclubs of the 1940s through to the 1970s and more information and tickets available here. 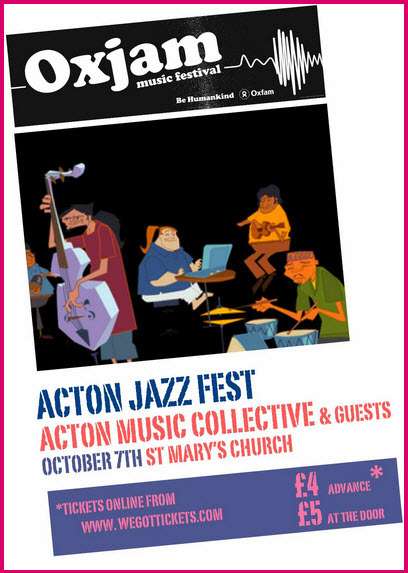 It's worth mentioning the organiser of these events supporting Oxjam in Acton, Dave Plotel, particularly as he is actually a Shepherd's Bush resident and indeed the Bush was were his prestigious music career began. As a teenager Dave performed with his brother in The Raven pub on Goldhawk Road and has since travelled all over the world performing and recording with big (and I mean big!) artists like Stevie Wonder, Ben E. King and Percy Sledge. He was also The Real Thing's guitarist when "You To Me Are Everything" reached number one, one of my favourite songs (see blog post title). I am gutted I'm not going to be around to attend either of these events and indeed would have loved to have tried to blag ten minutes of Dave's time to discuss a genre of music I absolutely love. However, I hope some of you out there can enjoy the music and the good cause these events are supporting. For more information check out top Bush lady and Bush Twitterati member's blog about Oxjam Acton here.